Born in Staffordshire, England, Bernard Evans began his training as an artist in Birmingham before moving to London in around 1870. 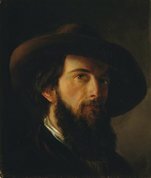 Although he was not prolific, he exhibited at the Royal Academy, the Royal Society of British Artists and the Royal Institute of Painters in Water Colours. He was also one of the founder members of the City of London Society of Artists. Evans was known primarily for his landscapes of the Midlands, Wales and Yorkshire, as well as for views painted in the 1890s inspired by travels to the south of France. Ostensibly an identifiable view that has been treated poetically, Cannock Chase – ‘When the sweet wind did gently kiss the trees, and they did make no noise’ c1885 is one of a number of pictures by Evans representing the forest of Cannock Chase in Staffordshire – a favourite haunt of natural beauty to which he returned repeatedly. The simplicity of the composition and the unified colour scheme add to the attractiveness of the prospect – a gently rolling forest glade with a herd of deer in the middle distance and a grassy path bordered with bracken. The work is painted in clear, layered washes and reveals Evans’s easy, fluent manipulation of the medium. His deftness of handling is especially evident in the drawing of the foreground ferns by partly wiping away the wet paint. The title of this graceful watercolour is taken from lines spoken by Lorenzo to his lover Jessica in act five of Shakespeare’s The merchant of Venice . Evans frequently appended literary titles to his landscape compositions during the 1880s in order to complement their mood of poetic suggestiveness. 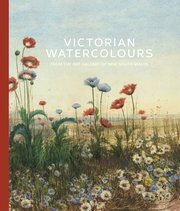 The growing trend amongst watercolourists to invest the landscape with sentiment and emphasise its lyrical, evocative qualities, as opposed to accurately and objectively replicating the appearance of external nature, is one of the key features of late Victorian landscape painting.